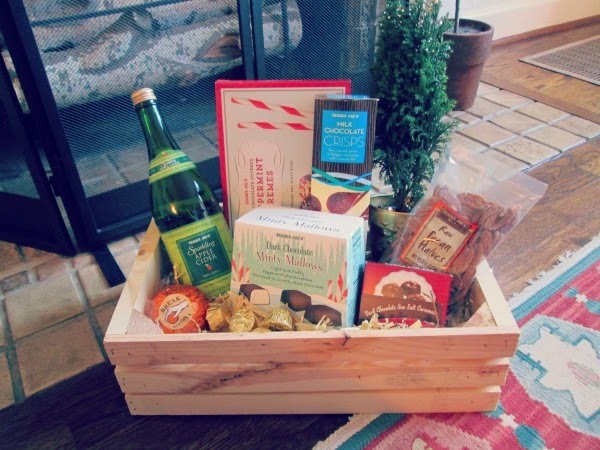 Trader Joe's List: Delightful and Easy Holiday Gift Crates! 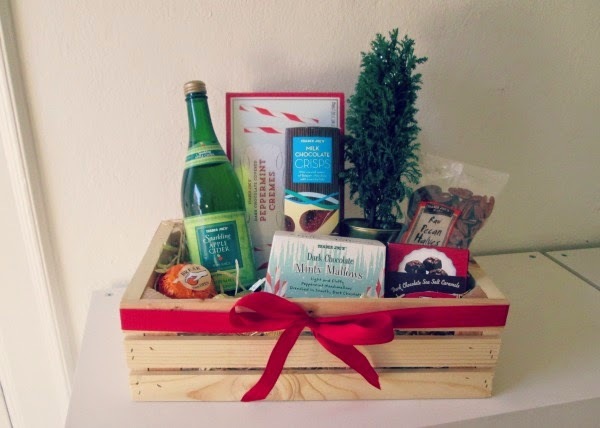 Delightful and Easy Holiday Gift Crates! 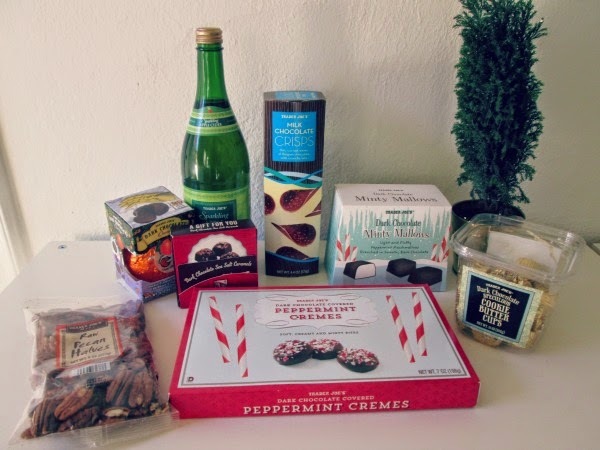 During the holidays Trader Joe’s carries delicious seasonal chocolates, nuts, and wines. It’s so easy to use these gourmet foods to put together a beautiful and thoughtful gift, without spending a lot of time or money. This is perfect for teachers, family friends, or someone else you want to do something nice for but don’t want to spend a ton of money! 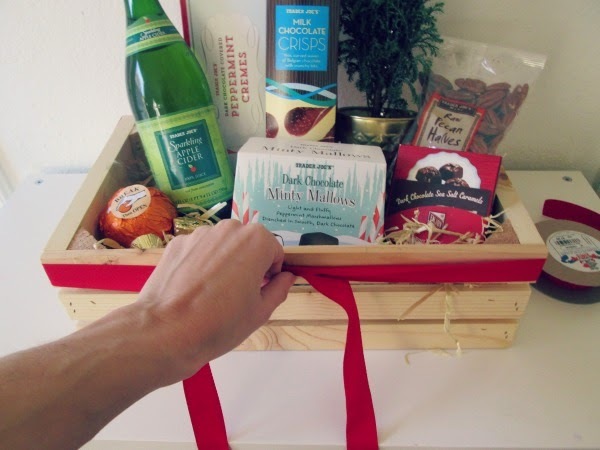 I picked some of my Trader Joe’s favorites for this fantastic gift. Everything I’ve chosen is delicious, but you can choose more or less expensive things depending on your budget. 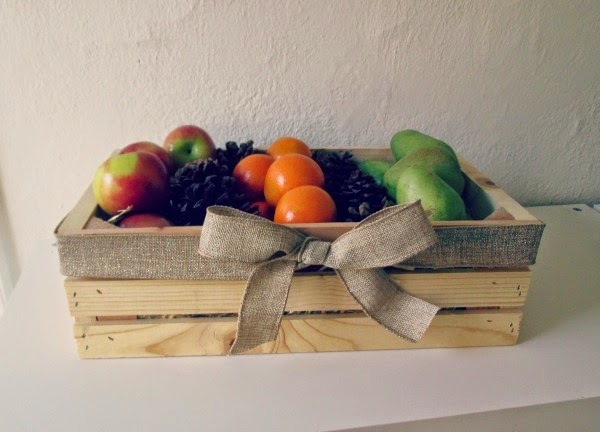 To make this beautiful gift, start with a medium-sized crate from Michaels (or use a wide, flat basket from home). Line the bottom of your crate with clear plastic wrap, newspaper, or recycled grocery bags. This prevents little pieces of straw from falling out of the bottom. 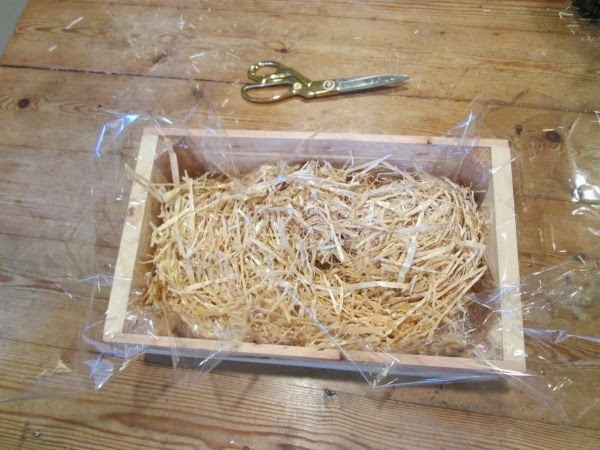 Fill the crate with straw and arrange your items as you see fit. Larger items in the back, smaller in the front. A few tips: I took the dark chocolate orange out of the box for a better visual and I shook the pecan bag because they had settled. I also took the Cookie Butter Cups (yum!) out of the plastic container and sprinkled them around for a more festive look! 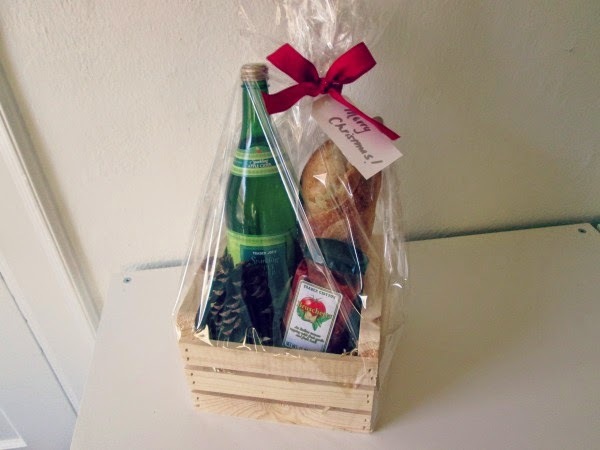 Add whatever ribbon you have on hand and this gift basket looks like you spend a lot more than $40! -Dark Chocolate Orange Break ($2.99) - these are divine and so much to “break” open! -medium-sized crate from Michaels (reg. $9.99 but with a 40% off coupon it is $5.99). -straw filling ($4.99) from Michaels (this is enough for multiple gift crates). 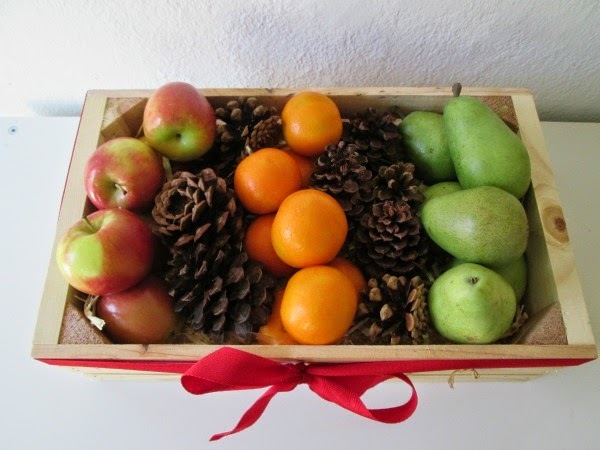 A basket of fresh fruits is always a welcome gift! This one mixed with pine cones smells absolutely divine. And it’s so pretty that it can be left out on the kitchen counter for everyone to enjoy. I love this gift for neighbors, bosses, and teachers; it’s a little more personal than a gift card. 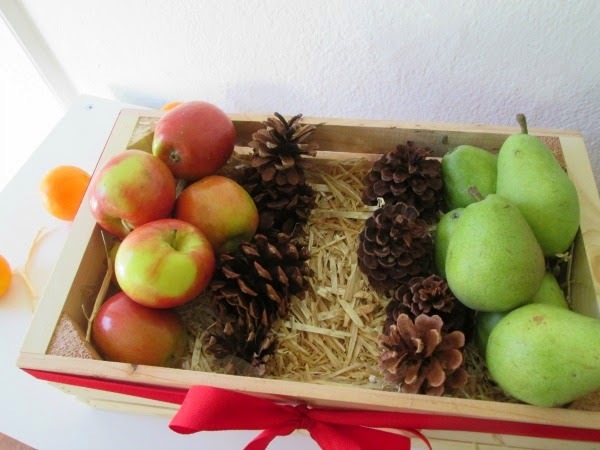 To get this “color blocking” look, put the pinecones in first, then the fruit. It is always gracious to arrive at a holiday party with a gift in hand. This hostess gift brings a little more thoughtfulness to the standard bottle of wine often brought to parties. 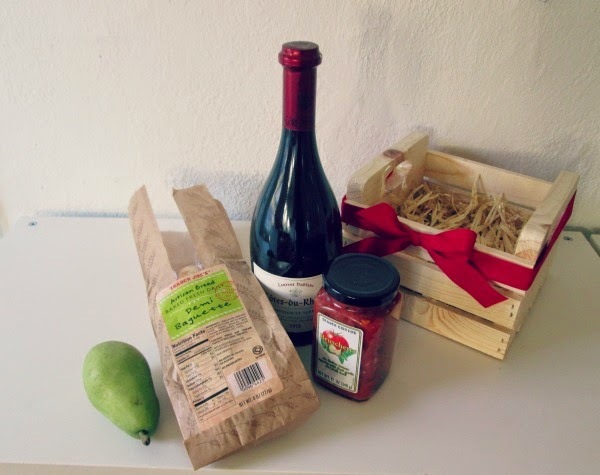 Grab your favorite Trader Joe’s spread or tapenade and a mini baguette and add your favorite bottle of wine to create a hostess gifts that really pops! (I used the small crate from Michaels for this gift). The great thing about gift baskets/crates is that once you have the standard materials (straw, ribbon, plastic wrap) they are so easy to pull together in a just a few minutes. What seasonal items do you love at Trader Joe’s? Comment below and consider packaging them together for a great gift. Post on Instagram if you do and tag @traderjoeslist and @dosaygive!